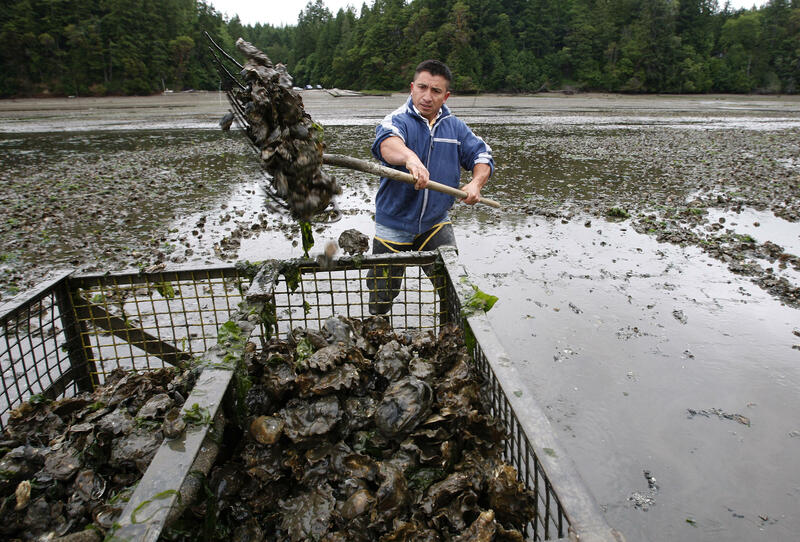 In this June 21, 2010 file photo, Efrain Rivera uses a pitchfork to harvest Pacific oysters at low tide at a Farm owned by Taylor Shellfish Co. in Oyster Bay, near Olympia, Wash.
It’s sometimes called the evil twin of global warming. Ocean acidification happens when carbon pollution from the sky is absorbed by the water. Washington state has been a leader in addressing the issue locally. And now the state has joined a new international alliance to fight ocean acidification on a global scale. 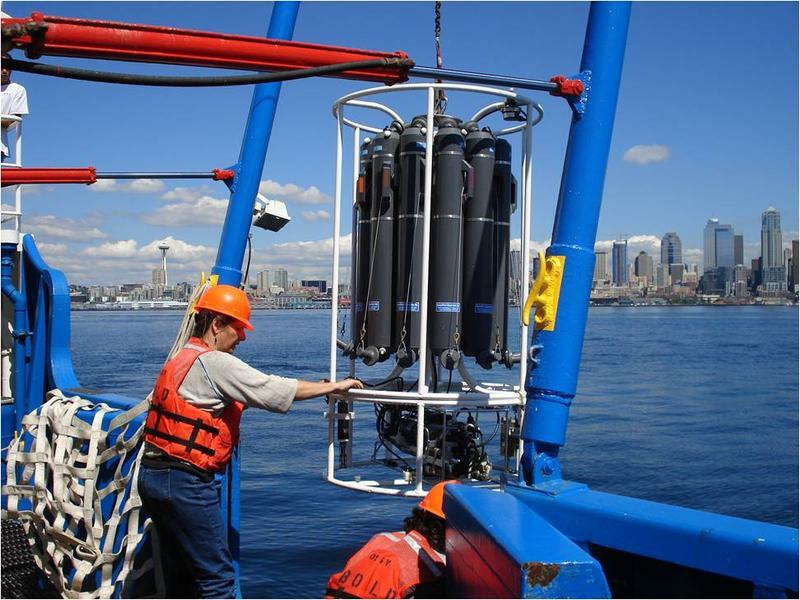 Washington state began addressing the problem of ocean acidification in earnest back in 2011, when then-Governor Christine Gregoire appointed a blue-ribbon panel on the issue. Gov. 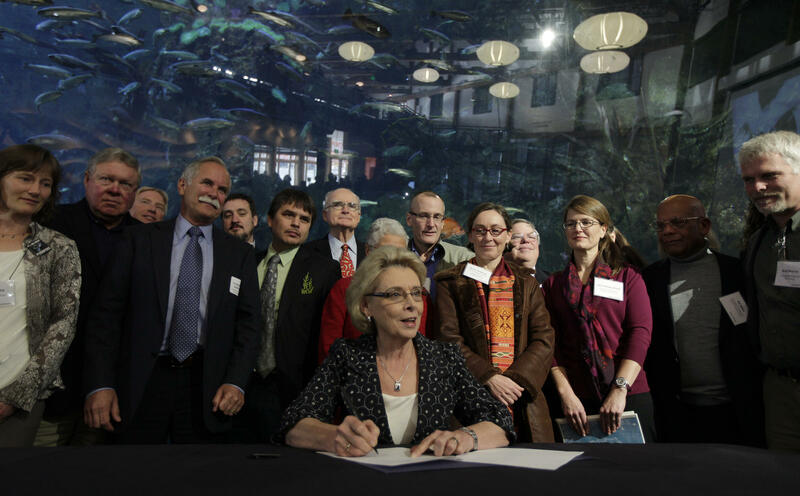 Chris Gregoire, center, prepares to sign an executive order as she sits with members of a panel she formed to address the issue of ocean acidification, Tuesday, Nov. 27, 2012, at the Seattle Aquarium in Seattle. Its recommendations led to the formation of a think tank at the University of Washington as well as a state-level advisory committee and an action plan to protect shellfish and fisheries that are damaged by the increased acidity of the ocean. “And that’s a high-value industry; it's commercial, recreational and even cultural for the tribes,” said Keith Phillips, a special assistant for climate and energy policy in Governor Jay Inslee’s office. Phillips says although Washington is leading the way for many others, who by joining the new alliance have just now pledged to create action plans to address ocean acidification, it doesn’t make sense for any one state to go it alone. “We can shut down the system and go entirely to clean energy and not emit carbon at all, but if the rest of the world doesn’t do that, the oceans will continue to get more acidic,” Phillips said. The new alliance includes all the West Coast states and British Columbia as well as Chile, Nigeria, France and several Native American tribes. All have committed to five goals, such as advancing the science, reducing the causes and building sustained support to combat ocean acidification. The University of Washington held its first annual symposium on environmental law last week. The idea is to choose a topic and examine how it fits into current and future regulations. This year’s focus—ocean acidification. U.S Sen. Maria Cantwell, D-Wash., and fellow Democrat Sen. Mark Begich of Alaska toured a lab in Seattle Monday to see the latest technology and highlight their hopes of making ocean acidification monitoring a national priority. 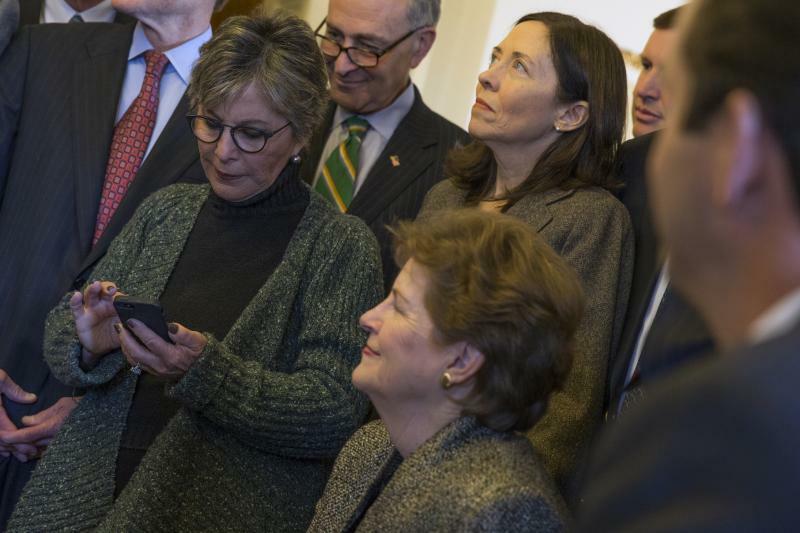 U.S. senators pulled an all-nighter Monday night to call attention to climate change. Democrats Brian Schatz of Hawaii and Barbara Boxer of California led the effort to shine light on the need for more curbs on carbon emissions. Sen. Maria Cantwell and Sen. Patty Murray were both present for the event. Cantwell took the floor early Tuesday morning following more than 12 hours of testimony. She said the issue isn’t about the future; it’s about negative effects that industries here are already seeing. Ocean health is at stake as Congress decides whether to confirm the next head of the National Oceanic and Atmospheric Administration. The nominee faced tough questions from Washington Senator Maria Cantwell, about funding for research of and adaptation to ocean acidification.